It is hoped that Nala’s heroics will lead to finding her a permanent home. She has been living at the Humane Society since April, and the shelter has been struggling to find a home for her. Nala, a pit bull mix was being walked by a Redmond, OR Humane Society volunteer last week, when she suddenly started pulling. Alan Borland thought it was unusual as normally she was great on her leash. Allowing Nala to take the lead, Borland followed her to a ditch just yards from the Humane Society where he found a small black and white dog curled up. Borland and Nala ran into the Humane Society for help for the dog, who appeared to be close to death. Once inside, staff identified the cocker spaniel as Chadwick, a blind 10 year old former shelter dog who had been adopted just a month earlier. A week before Nala found him, he had run away from his new home two miles away from the shelter. Bauersfeld believes that Chadwick lost his way in a snowstorm, and somehow managed to stay alive on the frozen streets for a week before Nala’s discovery. 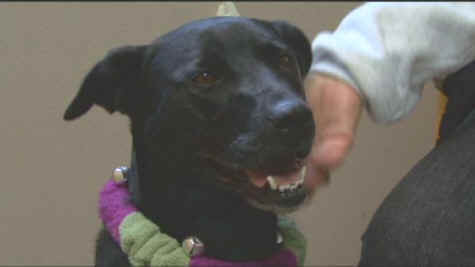 Once Chadwick had been treated for dehydration, he was returned to his owner, Tina Mazzariello who had been searching for him since his escape.